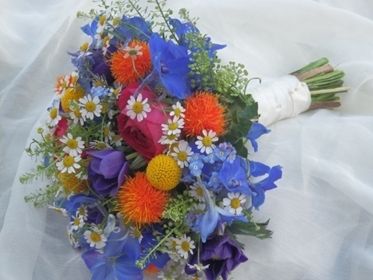 If you are planning a wedding for 2015, then you’ve probably already trawled the internet for the most up-to-date and unique touches for your nuptials. Every bride wants something that’s totally individual and personal, while incorporating elements that are on-trend. What makes vintage so appealing is that it offers brides a way to do ‘Princess’ in a classy way. Yet many are taking the theme and twisting it into something a little more nostalgic, according to Dalia Courridge from Norfolk Brides. “I found that recently the brides are particularly drawn to either more relaxed, bohemian and whimsical weddings at the countryside or woodlands…mixing the vintage and rustic items, quirky catering options and plenty of breath-taking views,” she elaborated. In contrast at the absolute other end of the scale, we’ll see clean, fuss-free themes that incorporate sleeker dresses and decor, shunning the pretty-prettiness that epitomises vintage. 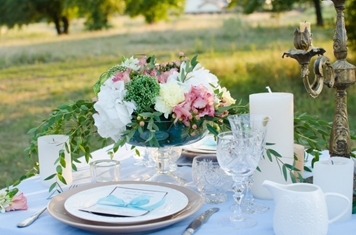 Expect to see plain invitations, understated cakes and simple place settings. Ignore ivory, worry not about white and give cream the cold shoulder; it’s all about pastels and metallics. Think instead of soft lavender, pale pink, powder blue or sugary sherbet shades. Contrast or combine with silver, gold, bronze and copper for an ultra-modern effect. This shift in hue has also been reflected in bouquets and floral displays, even though natural, ‘just-picked’ shapes and styles are still preferred. We anticipate this explosion of colour with great interest – it could make dressing venues for wedding receptions incredibly interesting and totally different. Ah, the wedding gown – the focus of the proceedings and the one thing above everything else which must be perfect. Bridal fashions come and go; it’s amazing just how many variations of a white frock there really are but for 2015, the trend for colours is expected to continue. We’ve seen pink gowns on celebrity brides including actresses Jessica Biel, Reece Witherspoon and Kaley Cuoco, while Piper Perabo tied the knot in a shiny, silver dress. However, it’s not just colours that are predicted to hit the aisles next year; key holes, 20s inspirations, low backs, cut outs and plunging necklines are all tipped for greatness. On the catwalks, designers like Marchesa presented lace overlays as a twist on the strapless gown and a romantic way to wear sleeves. Carolina Herrera showcased dreamy off-the-shoulder necklines while Rivini offered ‘naked’ lace worn over a neutral slip. These trends are likely to impact accessories and bridesmaid dresses, too. Dalia believes these choices could even venture in the arena of “polka dots to crop – tops”. Something that photographer Amy Turner, from Turner and Moss Photography has noticed while she has been snapping the happy pair is that weddings are becoming increasingly more uniquely personal to the couple. From casually-posed engagement photos to artfully framed pictures of the rings, today’s wedding albums are miles away from our parents’. No one puts the wedding cake in the corner! The cake has always been an integral part of the wedding breakfast, but it’s been more about the cutting than the design. Thanks to the many cake shows flooding our screens, couples have started to appreciate designer cakes. Hope says that elegant floral and lace accents are here to stay, but she’s noticed trends for different textures, too. Ruffles, frills and rosettes are big for 2015. 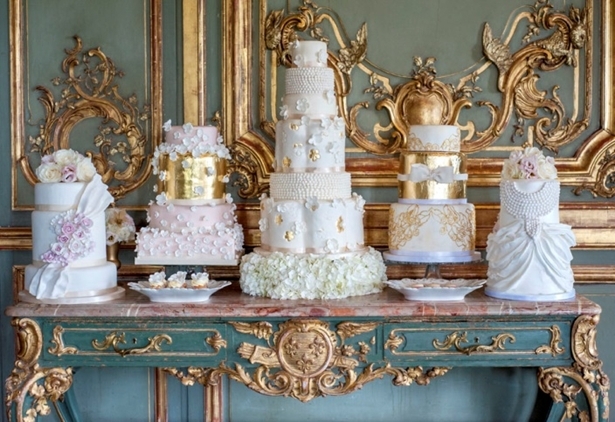 “It’s so versatile and creates drama and a real statement wedding cake. The ruffles and rosettes on the brides wedding dress can also be replicated on the wedding cake for a gorgeous personal touch,” she says. If that seems a bit too much for your tastes, rest assured that delicate decoration is also likely to be popular. “Beautiful and subtle white lace overlays or stencilling on white fondant icing is simple yet sophisticated, clean and very modern. Definitely a trend we’ll continue to see for a few more years,” Hope added.